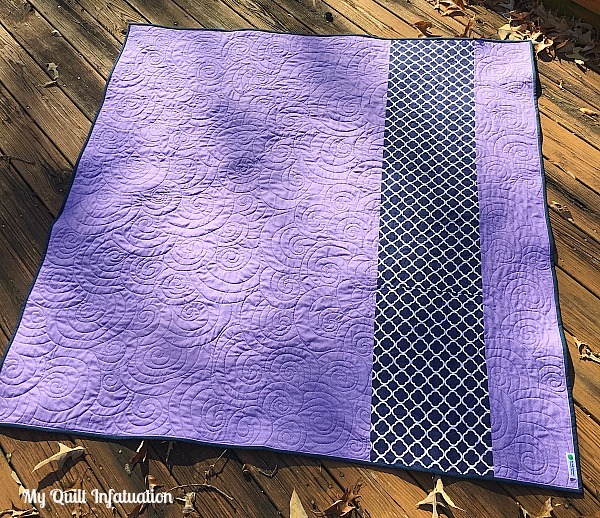 My Quilt Infatuation: Needle and Thread Thursday! Happy NTT, friends! Can you believe that Christmas is less than two weeks away? When I think about how little is left of 2016, it just shocks me. 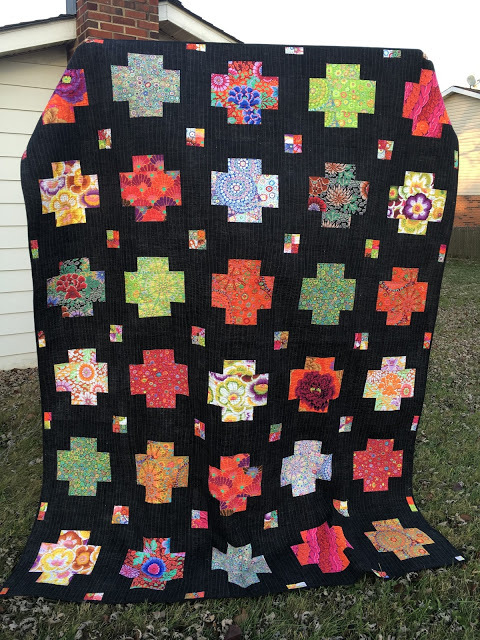 I finished another secret quilt, and I was brave enough to try another brand new free motion motif, and even more brave to quilt this brand new motif with contrasting thread. It's hard to tell with the sunlight throwing it into relief, but the thread is navy against the lilac backing. I've done swirls before, but these are nested together, which I found a little bit easier to control. 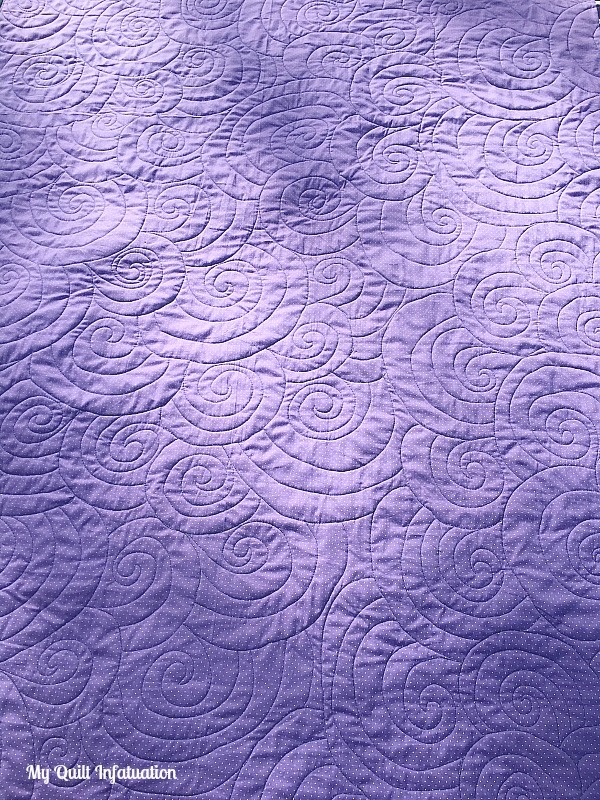 With this motif, I could easily avoid quilting myself into a corner by adding another ring on the spiral, making sure that I was heading in the right direction. The one part that is a little trickier is the fact that it includes lots of little overlapping stitches, so that took a little bit of practice. I like the result on this, but I will definitely be doing some practicing to make my spirals a little more uniform. This bit of improv awesomeness is from Luna Lovequilts. Okay y'all! Time to share what's going on in your sewing space this week! Your FMQ looks great! What machine do you use? Do you have a long arm? I haven't ventured much into FMQ yet, but a smaller long arm is on the horizon for me and I'm super excited! Tracing over past threads gets a lot easier over time. It looks amazing!! Great quilting, friend! The quilting is beautiful! Hope you finish up all your secret sewing projects by Christmas. Really lovin' your big swirls! I really want to try those ~ it's one of the things on my to-do list for next year! Thanks so much for featuring my Nonchalant quilt ~ it was quite a surprise to see it pop up on NTT! Oh, love the quilting, looks like snails; I like seeing you trying new designs!! Thank you for the linky party each week. Like Maryse said, snails! Because there's a QAL going to start Jan 8 with cute snail blocks; you have to join in just so you can quilt it like that! lol. That's a great quilting motif. The back looks great...can't wait to see the front. And now that I'm finally sitting down to comment, it's only ONE WEEK AWAY! Agh! Your quilting came out beautifully, though - I love all the movement!